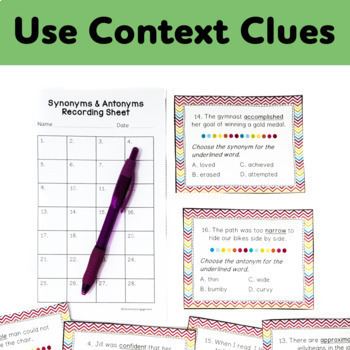 These engaging task cards offer a variety of options for your students to practice using context clues to determine synonyms and antonyms. ***This product is part of my Synonym and Antonym Bundle. If you purchased this bundle, you already own these task cards. *28 task cards - Each card has a sentence with an underlined word. Students need to determine the synonym or antonym for each word. Please open the preview for a detailed look at the contents. For more activities with synonyms and antonyms, click on the links below. Synonyms I have… Who has…? Antonyms I have… Who has…? 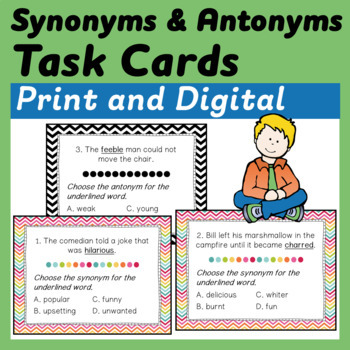 If you are interested in a bundle that includes all of these synonym and antonym activities, you can click on the following link. 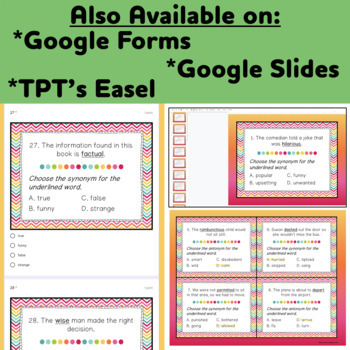 Click here to view additional sets of ELA task cards. Please let me know if you have any questions about this product. I want to make sure you are happy with your purchase.